You are invited to join us for our 3rd Annual Ridley Rush 1 Mile Walk /Run. This family fun run aims to raise awareness for the endangered Kemp’s Ridley Sea Turtle. 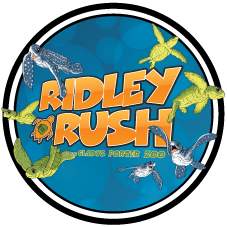 The Ridley Rush route will take you through the beautiful and scenic Gladys Porter Zoo as you experience what a baby sea turtle must endure on its rush to the ocean. As federal and state funds have dwindled over the years, this direct funding has become mission critical to sustain the Kemp’s Ridley Project and provide support to other sea turtle projects. The Kemp’s Ridley Project has both a successful track record and the real possibility of down-listing this most iconic of marine animals. Other proven sea turtle projects may receive funding to promote conservation efforts. The cost to participate in the Ridley Rush is $15 for adults and children. The cost covers entrance to the Zoo, race bib and medal and entrance to the Yappo Kids Fest, taking place after the race at the Special Events Building from 10:00 a.m. to 3:00 p.m. The Ridley Rush is sold out. For those of you that already registered packet pick-up is on Thursday, June 21, 2018 from 4:30 p.m. to 7:00 p.m. at Luke Fruia Motors, 2645 Barnard Rd, Brownsville, Texas 78520 or on Saturday, June 23, 2018 at 7:30 a.m. at the Gladys Porter Zoo in the Meadows Room. Thank you to 2 Run Crew, H-E-B, Metro PCS, Luke Fruia Motors for helping make this event possible.